The Black Keys, Black Angels in Concert The Black Angels and The Black Keys make raw, fuzz-filled riff-rock in the spirit of classic '60s and early '70s metal bands. Hear both acts in two full concerts, recorded live from Washington, D.C. This live webcast is a production of NPR Music and the 9:30 Club in Washington, D.C.
To download, right-click (pc) or control-click (mac) and save target or link to your computer. The Black Angels and The Black Keys make raw, fuzz-filled riff-rock in the spirit of classic '60s and early '70s metal bands. Hear each group in two full concerts recorded live from Washington, D.C.'s 9:30 Club. The performances originally webcast on NPR.org Nov. 5. 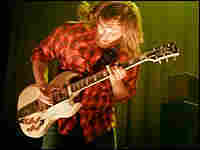 Guitarist-singer Dan Auerbach and drummer Patrick Carney are the lone members of The Black Keys. The Akron, OH duo makes hard-edged blues-rock larger and louder than many bigger bands. Rolling Stone calls the band's music "timeless." Friends since they were kids, Auerbach and Carney both dropped out of college and mowed lawns for a living when they first started their band in 2002. They got the name from a schizophrenic artist in Akron who called the two "the black keys," a phrase he used to describe people who "weren't quite right." 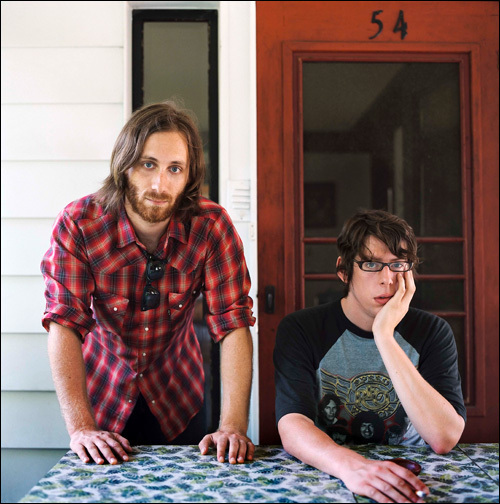 In four short years The Black Keys have released four critically-acclaimed albums. The duo's most recent release, Magic Potion, is their debut for Nonesuch records. "The idea was for people to be able to sit on a porch in Akron with a can of beer and blast the record through a boom box," says Auerbach. "People can depend on Pat and me to play music and be around for life. We have to: It's the only job skill we have." 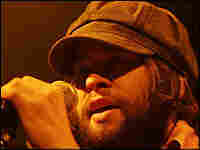 The Black Angels are from Austin, TX. They've been making music for just two years, but have already earned a large base of loyal fans and widespread praise from critics for the band's heavy-duty, trippy jams. 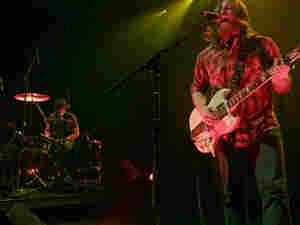 It's a sound The Black Angels call "Native American Drone Rock and Roll." 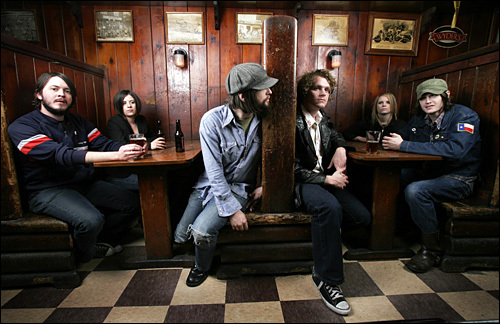 Taking their name from the Velvet Underground tune "The Black Angels Death Song," the six-member band moves through the acid-infused, hazy spirit of '60s psychedelia with a home-grown mantra: "Turn On, Tune In, Drone Out." It's an eclectic group of artists from diverse backgrounds. Bassist Nate Ryan was born on a cult compound; guitarist Christian Bland is the son of a Texas preacher man; organist Jennifer Raines grew up in a mortuary; and drummer Stephanie Bailey and vocalist Alex Maas believe a little girl in a red linen dress haunts the group's home. The band is also joined by Jennifer Raines on drone machine, multi-instrumentalist Kyle Hunt and, on occasion, projectionist Richard Whymark. Together, they say they're "marching forward into battle for your souls."